Well, here is some interesting news — and keep reading to find the kicker down near the end. I was recently told that a mass-circulation, national publication was going to carry a story on The Raleigh Call, the small part of the much larger JFK assassination mystery which I have been researching for almost 40 years. Not only did I find out about the forthcoming article, I was told that my research, publications, and lectures were to serve as the basis for it! Seriously?? And, as if all of that still weren’t enough, its author is Stephen Jaffe, a highly respected assassination expert — and, as it turned out, a very nice guy. Jaffe is the last surviving member of the investigative team pulled together by New Orleans District Attorney Jim Garrison to research the assassination. 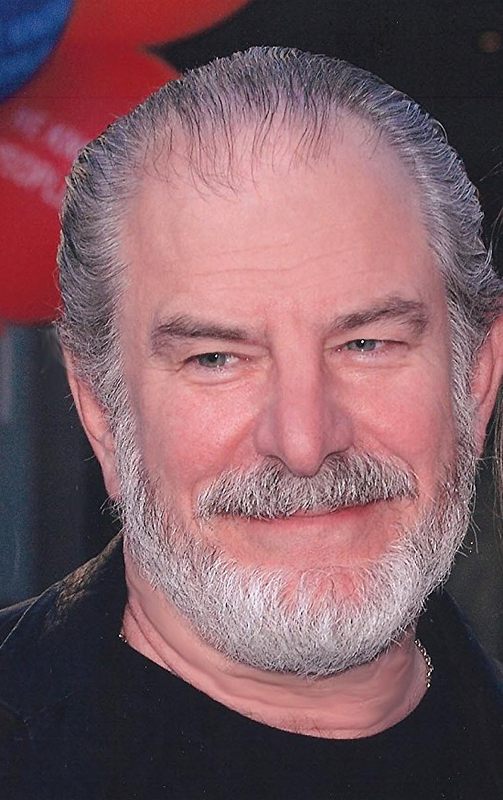 He also worked with attorney and author Mark Lane for many years on Lane’s myriad research topics, and he can be seen as narrator of key parts of Citizen Lane, Pauley Perrette’s engaging biographical documentary film about (and homage to) Lane. I had the pleasure of getting to know Jaffe by email, text, and phone in the last weeks (as he consulted me for facts, additions, and corrections), while he was putting the finishing touches on the article. He has become quite fascinated by the events and implications of the Raleigh Call (I certainly understand that! ), and he told me he was planning to devote an entire chapter to the Call in the book that he is now writing. How unbelievable and humbling is all that, I ask you?! I certainly never expected this kind of attention for my work. Seriously, though, you should allow no prejudice against Jaffe’s new article, or the recent series of articles he has written, based on any feelings you may have about the publication in which they have appeared. 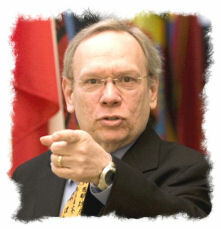 Jaffe demanded total content control as a non-negotiable prerequisite of his agreeing to write JFK assassination articles for the Enquirer. And because they really wanted to publish him based on his long and deep research experience, they granted him that. I went back and read Jaffe’s previous articles for the Enquirer, and I found them highly probing, concise, very well written, and welcome additions to the collective body of research. While Jaffe maintains complete textual control over his articles, he has zero say about the headlines and cover copy. As a result of that and the time deadline and space restrictions imposed by the Enquirer, a couple of errors slipped in unawares. The main error is found in both of the two headlines (on the cover and over the article). 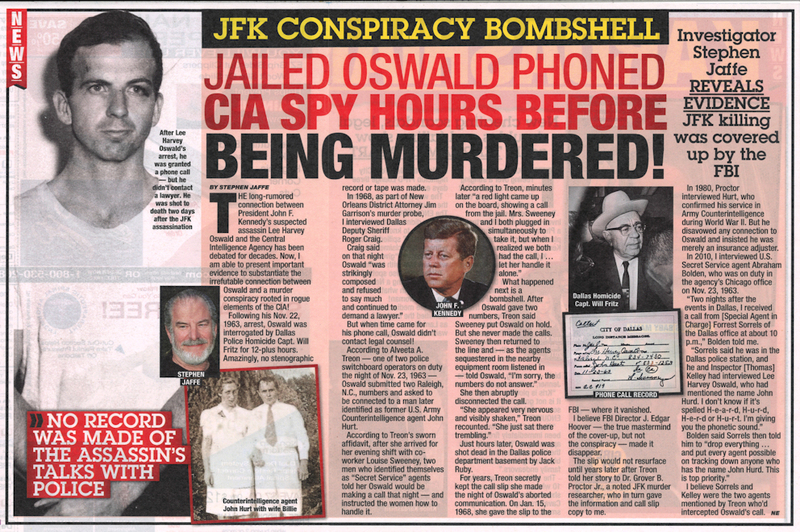 “JFK Murder Sensation: Oswald made jailhouse phone call to CIA agent!” If you read Jaffe’s article, you’ll see that the person whom Lee Oswald attempted to call was not CIA, but rather a former Special Agent for U.S. Army Counterintelligence. I think that’s explosive and provocative enough — but I suppose the magazine’s editorial staff thought “CIA” sounded sexier and perhaps more sinister. Even with this, and one or two other small glitches, Jaffe has written a very good piece, and he proved once again what a dedicated truth-seeker and accomplished writer he is. Anyway… getting back to this ol’ Southern boy — Who’da thought any of this would happen?! Certainly not me. HERE ARE THE COVER HEADLINE AND THE CENTERFOLD SPREAD ARTICLE BY STEPHEN JAFFE. TO SEE A LARGER (AND MORE READABLE) VERSION OF THE ARTICLE, CLICK ON THE IMAGE BELOW. What Was The Raleigh Call? It’s Saturday night, November 23, 1963, in the Dallas jail, sometime before 10:00 p.m. Though of course he cannot know it, Lee Oswald has only 12 hours left to live. Around this time, he lets it be known that he wishes to make at least one telephone call. That request set in motion the following train of events. The following narrative is told from the perspective of, and uses quotes from the testimony by, Mrs. Treon (1920-1999). As soon as Mrs. Treon sat down to begin work, Mrs. Swinney told her there would be two men — “I am not sure if she said Secret Service, homicide, or what” — coming to the switchboard room to listen into a call. “They had told her that they would be taking Lee Harvey Oswald to a telephone to let him make a call.” Mrs. Swinney made it quite clear that their superiors had sent instructions for them to cooperate with the men. As they were the only two operators at the board at that time, Mrs. Treon said she knew that either she or Mrs. Swinney would handle Lee Oswald’s call when it came through. “A few minutes after the men went into the private room, a red light came up on the board showing a call from the jail. Mrs. Swinney and I both plugged in simultaneously to take it.” Mrs. Treon was the first to say “Number, please,” but it was Mrs. Swinney who took charge of the call. “[I] let her handle it alone,” Mrs. Treon said later. “I did not unplug. I quit trying to handle the call and let her, but I stayed plugged in with my key open.” This meant that Mrs. Treon could hear everything that was being said to Mrs. Swinney by Lee Oswald. Mrs. Treon’s 20-year-old daughter, Sharon — who also worked for the Dallas Police Department, as a records stenographer in the Records Office — had come in to visit with her mother that night, and was sitting in a chair a few feet away from the switchboard. Sharon asked her mother, if it worked out that she handled Lee Oswald’s call, “to make a memorandum of it — a copy of the original ticket — as a souvenir.” When it was clear that Mrs. Swinney was taking the call, Mrs. Treon sat back and listened. “I listened and watched very carefully for Mrs. Swinney to place the call with the long distance operator. She appeared very nervous and visibly shaken. For a few minutes she just sat there trembling.” Mrs. Treon would later comment that she understood Mrs. Swinney’s nerves. “I continued watching and listening but she did not place the call.” Because Mrs. Swinney’s key was closed, it was not possible for Oswald or the men in the equipment room to know what was happening, nor whether she had placed the call that Oswald had requested. In 1978, Captain Will Fritz of the Dallas Police Department was asked by a Congressional investigator if he remembered sending any of his homicide detectives to the Switchboard room to monitor Oswald’s calls. 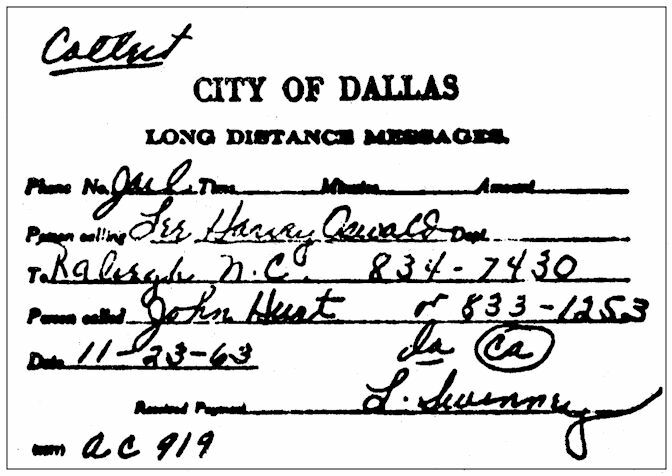 Captain Fritz said he did not remember giving those orders, “but he stated that it still could have happened.” He further noted that Dallas Jail records “show nothing relating to a call from Oswald to John Hurt,” but that would be consistent with the fact that the call was never attempted, and Mrs. Swinney made no official record of Oswald’s request. 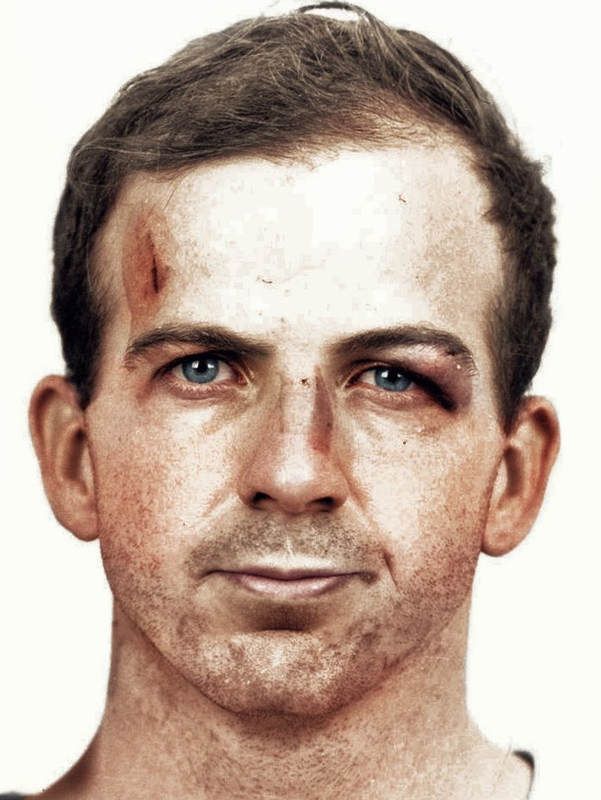 To read more about the man in Raleigh, NC that Lee Oswald was trying to call, as well as the implications for this man having been a former Special Army Counterintelligence Agent, you are invited to read the entirety of The Raleigh Call and the Fingerprints of Intelligence by clicking here. « The Letter Man Is Coming!